This shiny Lexus IS250 was created for the Australian International Motor Show in Sydney, sprayed with special MirraChrome paint by KMC Corporation. It also features a new sporty bodykit that’s not available on the market yet, but will be soon, introduced as a genuine Lexus Accessory later this year. 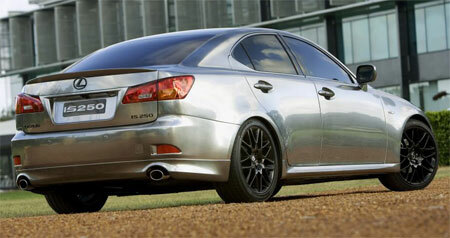 For those who don’t know what a Lexus IS250 is, it’s the successor to the previous IS200/IS300/Toyota Altezza line of BMW 3-series/Benz C-class competitors, powered by a 2.5-litre Quad Cam VVT-i engine. In Australia, Lexus sold 200 more IS250s than C-class cars, beating the three pointed star marque by 200 cars, but the top position of the small luxury sedan is still occupied by the BMW 3-series. One more rear-shot after the jump.